Beannachtaí na Féile Pádraig daoibh go léir! Wishing You All Good Health & Well-Being for the New Year! Athbhliain faoi Shéan agus faoi Mhaise Dhaoibh Go Léir! & Well-Being for the New Year! faoi Mhaise Dhaoibh Go Léir! 31 October Oiche Shamhna Shona Dhaoibh! and not be terrified of potential anti-social behaviour. 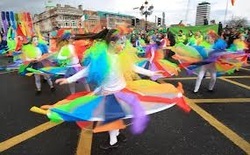 I'll be at the parade in East Wall, gathering at the Youth Club from 6.30. It has been fantastic the past few years - hundreds taking part, and coming from other communities, finishing at The Haunted House in the Playcentre. Presentation reflecting the changes in the city in the past thirty years. education and the community sector itself. McCarthy and Mick Rafferty on behalf of the festival collective. Looking Back for New Beginnings: A Community Celebration and Renewal. Thirty years ago, activists from the North Inner City organised a month-long Looking-On Festival to showcase the problems facing this community in a creative and stimulating way. To commemorate this event, we are holding a conference in Liberty Hall over two days as set out in the programme below. The chief aim is to look at the changes in the city and community in the intervening period. amounted to a serious abuse of the planning regulations. something very rotten at that time. There are other examples of it. people from which to select people, but what happened was appalling. at the heart of any type of development there. Olympic Torch, welcome to Dublin Central this morning! ag Baile Átha Cliath Lar, ar maidín! supporting so many great causes! It was a special honour to be present at inauguration. Both speeches were so positive. 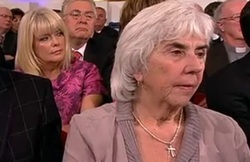 Comhghairdeas chuig Micheal D ! Tá áthas orm agus tá a fhios agam go ndéanfaidh sé 'job' iontach mar Uachtarán na hÉireann. Comhghairdeas chomh maith chuig a bhean chéile Sabine agus a chlann. Bananas on the Breadboard is a 52 minute film that celebrates the life and traditions of women street traders from the markets area. Directed and edited by film maker Joe Lee (Dublin City Council’s Film Maker in Residence 2009). Produced by Fidelma Bonass (HSE Development Worker), Danny Pender (Markets Area Resident) and Joe Lee (Film Maker). It is a must see for anyone interested in stories from and about Dublin. These were words of Northern Ireland Assembly Environment Minister Alex Attwood MLA ,speaking of the permanent ban on hare-cousing introduced in Northern Ireland on Wednesday 17th of August. Today marks another milestone in the campaign to outlaw hare coursing on the island of Ireland, as a permanent coursing ban comes into effect in Northern Ireland. However, here in the Republic, now the last bastion of this backwoods barbarism, it's business as usual for the hare coursers, with the licence to net hares issued recently by the Minister for Arts, Jimmy Deenihan. 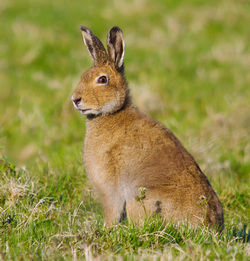 ICABS has expressed disappointment to Minister Jimmy Deenihan following his shameful renewal of a coursing licence that will result in suffering for thousands of Irish Hares. The licence issued by the Minister for Arts, Heritage & An Gaeltacht to the Irish Coursing Club allows affiliated clubs all around Ireland to capture hares from the wild for another season of coursing cruelty. 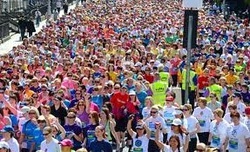 Each year around the 24th of July, the Samaritans highlight the 24-hours-a-day, 7-days-a-week nature of its work. All photographs in the exhibition were taken by photographer Derek Speirs. 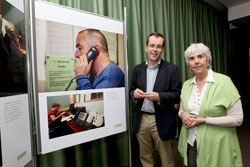 Maureen met with the Dublin Samaritans' volunteers & national representatives for the organisation. Further information about Samaritans is available at www.samaritans.org. There is AWEPA work as I am finding my way around what it means to be head of the Irish section. I am looking forward to opening an art exhibition in the Axis Ballymun Arts Centre on Wednesday. This has been organised by Post Polio Support Group, sponsored by Tolka Area Partnership and Art Squad Finglas. ThePost Polio Support Group arrange art classes for those interested and this exhibition is a fund-raising venture for their art classes continuation. Then will see what else the week brings? This week I experienced the relentlessness of the media in pursuing a story. I answered every call, responded to every request for interviews on radio and TV, in English agus as Gaeilge. It would have been so easy to have turned off the phone - it might have been reported as 'Deputy O'Sullivan was not available for comment'; or to have answered with 'No comment at this stage' and then wait to see how the political winds were blowing. But I made my decision that it was up to the electorate in Ireland to decide. This is still an important issue. The electorate should have had the opportunity to give a resounding no or yes to Senator Norris. A WORK experience scheme to encourage migrants to become involved in politics and to increase diversity in the Oireachtas will be announced today. Maureen O'Sullivan TD asked the Minister for Arts, Heritage and the Gaeltacht Jimmy Deenihan TD the progress that has been made to date in implementing the Programme for Government plan regarding the arts and in particular the progress made in seeking to capture some public good from the National Assets Management Agency by identifying buildings that have no commercial potential and which might be suitable as local facilities for art and culture particularly in Dublin Central. "I wonder whether the wrong people are being regulated excessively. It should be senior bankers and not the person on the street who did not trigger the problem in the first place"
"On Wednesday, 20th July the Taoiseach Enda Kenny TD used the words “dysfunction”, “disconnection”, “elitism” and “narcissism” about the church. Those words could equally be applied to our banking institutions. We cannot but be struck by the fact that at least apologies are coming from certain quarters in the church but there has been a lack of similar apologies from the banking authorities." "My final point concerns the need for regulation in all our institutions, including the church, the State and Departments, and the need for regulation regarding the big level operators and the big commercial interests. What appears to be happening is that families, those looking for mortgages and small businesses are being swamped by excessive regulation. 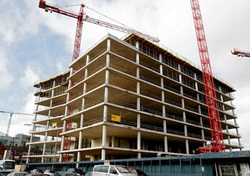 Such swamping is delaying real activity in the real economy, thereby leading to a stagnation in Irish society. Consequently, banks and lobbyists for big business are setting out to convince people that less regulation is required.. . . .
. . . I wonder whether the wrong people are being regulated excessively? It should be senior bankers and not the person on the street who did not trigger the problem in the first place." "What is it about the institutions in this country - the church and the State - that they have this ability to treat children and young people so cruelly either in carrying out abuse or allowing it to continue?" "I welcome that the forthcoming Bill will also includes crimes against intellectually disabled persons, the national vetting bureau and Children First guidelines. We have all the measures now, but I agree with the Ombudsman for Children that we must have the resources to match." AWEPA works in cooperation with African Parliaments to strengthen parliamentary democracy in Africa, to keep Africa high on the political agenda in Europe and to facilitate African-European Parliamentary dialogue. The Association of European Parliamentarians for Africa (AWEPA) is an international non-governmental organisation founded by European Parliamentarians to reduce poverty and to protect human rights by supporting the well functioning of parliaments in Africa and by keeping Africa on the political agenda in Europe. With its roots in the campaign to end apartheid in South Africa, AWEPA now works in Africa from a development perspective to strengthen the core functions of parliaments: oversight, representation and legislation. It believes that strong parliaments are fundamental for Africa’s development; for peace, stability and prosperity. I will meet the African Heads of Mission through the Joint Committee of Foreign Affairs & Trade, also the EU Stabilisation processes with Serbia will be discussed - I have been supportive of the Bosnian community. I will be at the launch of the Dublin Theatre Fringe Festival, early Wednesday in the Project Arts Centre. There are also a number of community meetings I will attend. In this week, the last time the Dáil will sit before a summer recess, I will have a number of opportunities to speak: I will speak on the Cloyne report motion, I will make a response on the Central Bank & Credit Institutions Bill and I will debate a priority question with the Minister for Arts, Heritage & the Gaeltacht. I have been included in the Oireachtas consultation group on the commemorative programme which will hold an initial meeing, I will raise issues on the inclusion of Moore Street sites as part of 1916 centenary programmes. 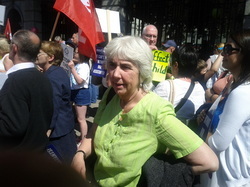 "The abusive treatment of children in institutions represents one of the darkest periods in our history"
On Thursday, Maureen speaking on the Residential Institutions Redress (Amendment) Bill was quote in the Irish Times article (read in full here) "That pain did not stop with those who directly experienced abuse. The Dublin Central TD said “in the north inner city we are seeing the impact on the next generation, with the children of abused survivors equally turning to drugs, alcohol and suicide”. Minister for Education and Skills Ruairí Quinn TD answered: I can confirm that the school to which the Deputy refers has made an application to my Department for permanent recognition. The application is currently being assessed and my Department expects to be in a position to convey a decision to the school authority shortly. The Deputy will be aware that in the context of making provision for the long term accommodation needs of the school, my Department has conducted technical inspections of two properties at the request of the school authority. A proposal has been forwarded to the land owner for consideration. My Department is currently awaiting a response to this proposal. 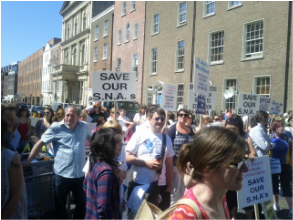 The protest was organised & addressed by Special Needs Parents Association, Down Syndrome Ireland, Impact, the United Left Alliance, the Dáil technical group and the Enough Campaign. "I can not understand how a commitment to reduce the numbers of SNAs could have been included in the terms of the EU-IMF agreement." "Central to the issue we are discussing, namely, the education of children with special needs, is the core principle of integration and inclusiveness in our education system and that we support a system which includes children with special needs - physical, mental or both - Traveller children and foreign national children." "Parents of special needs children need support and assurances that the needs of their children will be met by the State and not threatened by the State"
"It all depends on the needs of the child, and that is where the emphasis must be placed. The needs of the child should determine the system, not the other way around." Maureen went on to question aspects of the Bill and wider context of our Defence Forces. Why is there a need for a separate judicial system for members of the Defences Forces? Questioning a token military presence in Afghanistan,Democratic Republic of the Congo, Ivory Coast and Somalia which have appalling records on human rights issues and the role of our troops in those countries. We have all been touched in different ways by our time here; our own students have been fantastic - they have taken on everything with a heart and a half, including the difficult conditions where we are staying, getting up before 7 most mornings, cold showers, back in hostel before 9.30 every night. Zambia has such natural wealth not to mention arable land, good water system, ideal weather and yet so much food is imported - cheese from South Africa , powdered milk from Ireland - there is so much potential here for small agri business and I know many of the NGO's are doing that. We are also conscious that elections are due this year - the incumbent Mr Banda is everywhere. It seems to be very much about personalities and not about issues. 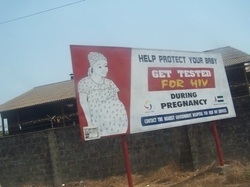 Something else that is so obvious everywhere we go is the awareness and publicity about HIV and AIDS - posters, bill boards encouraging people to take precautions, be tested etc. So alarming to see one saying that as soon as your baby is 6 weeks old to get the baby tested! I am looking forward to home. I do know that there'll be lots of work to follow-up on in the Dáil & in Dublin Central. I hear that a few things have been going on. I will get to speak on our Technical Group's Private Members Business on Special Education Needs this week. I have strong views about where the education cuts are being made. Maureen questioned Tánaiste and Minister for Foreign Affairs and Trade Eamon Gilmore TD to raise Irish concerns over the recent deaths in the past month of Amazon forest residents who have questioned the legitimacy of loggers, with the Brazilian Ambassador. Read the question & reply here. In response to widespread international pressure some of the Brazilian government reaction was reported in the Guardian on 06th July. Maureen asked Minister for Justice & Equality Alan Shatter TD a number of questions about asylum seekers' treatment, care & excessive length of application processes and whether he will review their entire treatment to better protect the aslyum seekers' human rights. Maureen's visit with some students & teachers from St Mary's School, Baldoyle, is to Mary Aikenhead Open Community School Kabwata, Lusaka, Zambia. St Mary's is one of a few schools in the country pioneering the fifth theme on "European and Global Citizenship" in the An Taisce Green School Programme. European and Global Citizenship is about rights and responsibilities associated with being a citizen of Europe and the world. It also means linking with Europe and the world on environmental problems such as food shortages, clean drinking water, global warming and global justice. On the theme of global justice, students and teachers have raised up to €10,000 for the Zambian school. Look for more updates over the coming week. Mary Aikenhead Open Community School is led by Sr. Anne Kennedy a native of Baldoyle. She taught for many years in Ireland, including in Gardiner St National school. achieving universal primary education for all children and through fund-raising, better facilities have been built and developed. The Zambian government is now also involved Watch the short videoclip of the celebration of the completion of a large extension in last year. "I think women have the ability to stand on their own two feet to be the nomination", Maureen said, "Parties have to ask themselves why they are not being more pro-active & supportive of women". When approaching any legislation basic questions should be asked with regard to whether it will make a difference, what sort of a difference and whose lives will be affected. The question under Commerative Events was put to Jimmy Deenihan T.D. 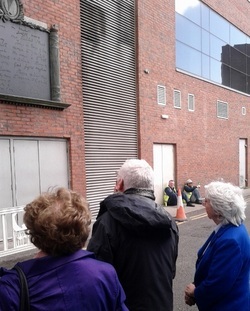 replicated in monument here that Maureen, Joe Higgins & Catherine Murphy are looking at. "The innocent lives lost in the Dublin and Monaghan bombings will be honoured only when the truth is told."